Digital TV aerials are essential pieces of equipment which allow you to access a wide range of channels. Whether you want to access Terrestrial or Freeview TV channels, our experienced team are here for you. With more than 100 channels on offer, it’s no surprise that some many people are keen to take advantage of digital tv aerials. Here at Dale Comm, our TV aerial fitters in Leeds can provide full installation services for all kinds of properties. The Dale Comm team has more than 25 years’ experience when it comes installing and fitting TV aerials in Leeds. Whether you’re looking for commercial or domestic TV aerial fitters, get in touch with our team today. Our engineers are proud to deliver an expert service in the most cost-effective manner possible. 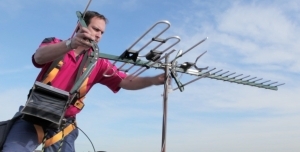 What Do Our TV Aerial Fitters in Leeds Do? When you choose Dale Comm’s experienced aerial fitters to handle your installation, we’ll arrange the perfect time for our engineers to attend your property. We will immediately conduct a survey to discover the best aerial for your needs. We can also draw up a plan to fit your TV aerial in the most effective position while minimising disruption to your home or business. Where Can Dale’s TV Aerial Fitters Install My New Aerial? Inside Your Loft or Attic. Call our aerial fitters in Leeds for your free quote! Even if you already have a domestic or commercial TV aerial, upgrading can allow you to enjoy more reliable entertainment. Modern aerials can deliver a clearer signal, and often access a wider range of channels through Freeview. If you’re stuck with terrestrial channels, or your older aerial has suffered any kind of damage, upgrading can be essential. Here at Dale Comm, we’re able to deliver a full range of digital TV aerial systems to suit your needs. Our experienced team can provide a digital aerial upgrade service to ensure you have the best aerial to suit your needs. Here at Dale Comm, our engineers are fully-trained and accredited aerial fitters. With more than 25 years’ experience, our fitting and installation team can deliver an unbeatable service to all kinds of properties. We are fully certified and have worked alongside some of the biggest names in Yorkshire to deliver an unbeatable fitting service. For more information on the services our TV aerial fitters in Leeds can provide, get in touch today. You can reach our experienced team directly by calling us directly on 0800 633 5311. If you prefer, you can use our simple online contact form and we’ll get back to you as soon as possible.